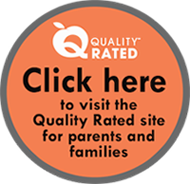 Welcome to Georgia’s Quality Rated website, and thank you for your commitment to providing care to Georgia’s children and families. By participating in Quality Rated, you are joining hundreds of providers who have accepted the challenge to embark on a path of continuous quality improvement! Quality Rated is a systemic approach to assess, improve, and communicate the level of quality in early and school‐age care and education programs. Similar to rating systems for other service related industries, Quality Rated assigns a quality rating to early and school‐age care and education programs that meet a set of defined program standards. Quality Rated will support your program as you strive to reach higher levels of quality. If you have any questions or comments or need support, consult the Quality Rated Program Manual or call the Quality Rated Help Desk at 1-855-800-7747. Create an account and complete a brief application with demographic information about your program to get started on the path to becoming Quality Rated. Select Create Account on the left and follow the posted instructions. Confirm your account by completing the directions emailed to you. Log into your account to complete the application by entering basic demographic information about your program. Register for the Quality Rated Orientation. Earn points by submitting evidence of the credentials and training of the teaching staff, your program’s commitment to child health and physical activity, the ways you support family engagement, practices around instruction and curriculum, and your classroom ratios and group size. Log into your account and select Create Portfolio. Earn points based on your support of the development of children’s reasoning skills, social-emotional development, language acquisition, and school readiness. Receive an Environment Rating Scale (ERS) observation within 90 days of your portfolio being accepted. One-third of each age group will be assessed. Rating received within 60 days of ERS observation. Once you receive your rating, you may select your Bonus Package.